Ride Gear – What Do You Carry When You Ride? Are you a bicycle pack Rats? Although I was never a Boy Scout, I like to be prepared for the worst when I ride on my long commutes. Spare Tube – I switch this out between a 26″ or 29″ depending on what I’m riding. This group is inspired by another flickr group: “The Items We Carry“, posts like this shot from timbuk2, as well as an interesting article in the first issue of Bicycle Times magazine. 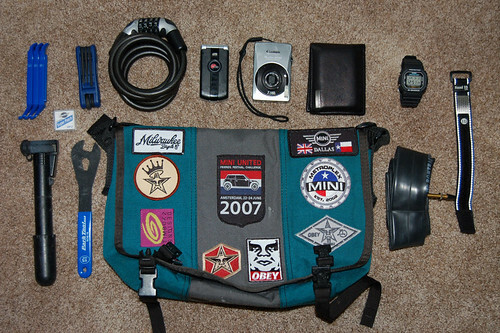 “Stuff I Carry When I Ride My Bicycle” is a small group of pics, but growing steady. IF you are a bicycle pack rat or just a Boy Scout at heart, please take a moment and take a shot of the stuff you carry and post it there as well. Good stuff. I really like the Shepard patches on your bag though. Nice Touch! Thanks! I get so many compliments on the Shepard Fairey patches. I’m glad I got them.